But what caught my eye (in addition to the raging and overt march to diabetes, obesity, heart disease and cancer), was the table across from me. 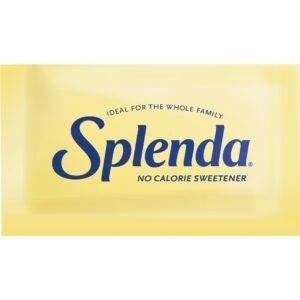 In addition to gorging on insulin-spiking, pro-inflammatory grains, the four adults (who were actually 7.5 adults in their total weight), were dumping Splenda into their coffee like it was fairy dust. I wanted to walk over, drop to my knees and beg them to … ‘PLEASE, PLEASE, PLEASE STOP EATING THESE TERRIBLE CHEMICALS – THEY’RE SLOWLY POISONING AND KILLING YOU’. By the way, in case you were wondering what I ordered off the insulin land mine field they call a menu, I had Smoked Salmon Eggs Benedict, 86 the bread, and a side order of sauteed spinach. It was super yummy, and because it had plants, fats, and protein, the meal was very nutritious, satisfying, and healthy (no sugar, no processed vegetable oils, no grains -> fit for human consumption). Don’t have time to read this? Want the bottom line, the take away? Artificial sweeteners are extremely toxic and should be one of the foods you never, ever eat. Stay away from artificial sweeteners like you would a drunk driver waving a gun out the window. Yes, they’re that bad for you. Our world is filled with deception, to be sure. From our presidents’ lying to us, to sophisticated advertising about food (such as ‘Milk does a body good’ – the best advertising campaign AND best food scam in the past 50 years), it’s become difficult at any given moment to sort out the truth. When it comes to filtering out accurate information regarding health, the waters become even murkier. Another major area of food/health deception is the perceived harmlessness of artificial sweeteners. To the vast majority of people, a Diet Coke® is a relatively “healthy” beverage choice, they think, because it has no sugar or calories. Nothing could be further from the truth. For more in depth information on this terrible food additive, read here.